With more than 600 Stryker Rejuvenate hip cases centralized as part of an MDL in the federal court system [more on the MDL process], U.S. District Court Judge Donovan Frank has indicated that a small group of cases will be ready for trial in Summer of 2015. This small group of cases, known as “bellwether” cases, are scheduled for early trials designed to get some preliminary data on how juries react to the cases, so that the parties can make informed decisions on settlement. This is crucial towards moving the litigation forward and ultimately towards resolution. Cases don’t settle because the parties disagree on the value of the claims. Trying a few cases helps everyone take an honest look at the merits and the value of the cases. Practically, many medical device companies have in-house counsel that tries to brainwash the real people making the decisions that plaintiffs’ claims can be defended. Then you have the defense lawyers who are making plenty of money and have every interest in seeing the cases go on. I think if the Stryker higher ups see a few verdicts, they are going to stop listening to their in-house counsel and their outside lawyers because the juries will be speaking loud and clear. So the only really bad news for plaintiffs is that the trials don’t begin until 2015. There is no arguing with the fact that justice is painfully slow in these cases. In addition to those cases filed in federal court, there are at least 873 cases pending in New Jersey state court, with additional claims filed in Florida state court. In New Jersey, all of the Stryker hip lawsuits have been centralized before one Superior Court judge as part of a Multi-County Litigation (MCL). MCLs consolidate the cases for discovery purposes, as there are similarities between the underlying cases such as witnesses and evidence that will be common to all of these Stryker hip lawsuits. Last year, a mediation process was established in an attempt to see if the Stryker Rejuvenate cases could be settled. At least eight of the nine cases that have gone to mediation have agreed to settle. All of the lawsuits involve similar claims regarding the tendency of the Rejuvenate and ABG II hip stems to fret and corrode, causing the recipients to experience osteolysis, tissue necrosis, and other complications that require replacement of the device. Revision surgery is generally more difficult and takes longer to perform than the initial hip replacement, according to the Orthopaedic Research Institute. Causes of action listed in complaints against Stryker Orthopaedics include strict products liability, negligence, and breach of warranties. 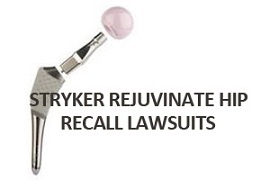 Stryker first recalled the Rejuvenate Modular and ABG II modular-neck in July 2012 after the company determined that the metal hip stems could fret and corrode at the modular-neck junction. The company has recommended that all Rejuvenate and ABG II recipients undergo blood and imaging tests to ensure that their hip stems are functioning properly, even if they have not experienced any symptoms of a failing hip implant. Although a typical hip replacement is expected to last between 15 and 20 years, the defects with these products were detected in less than two years. Sadly, there has been an epidemic of dangerous and defective hip implant products being sold in the U.S. over the past 10 years. The dangers of these products have only come to light in the past few years. DePuy maker Johnson & Johnson recently made offers to settle lawsuits involving nearly 8,000 patients for more than $4 billion. I think there is a strong argument to be made that these cases should be valued higher. Stryker thinks the value of the cases is lower because they did not have a DePuy-like prolific recall that was on the front page of every paper. But that is not going to be a driving force to a jury who is looking at the evidence in one of these cases. If you have been hesitant to speak to an attorney, you are not alone. Many people have sat on viable claims. But now is the time if you want to get compensation for your injuries. If you or a loved one has been a victim of these extremely defective products, contact us to discuss your concerns. There have already been many settlements around the country in Stryker cases and more, we believe, are around the corner. If you have a question about a claim or settlement, call 800-553-8082 or get a free on line consultation here.